WAIST HIGH: 2010 Richard Blade Los Carneros Chardonnay Anyone? 2010 Richard Blade Los Carneros Chardonnay Anyone? Along with a RATT N ROLL "Slip of the Lip" Cabernet Sauvignon and a Warrant Red Napa Valley, part of St. Helena, California winemaker Kristian Story's Artist Series of wines includes a Richard Blade Los Carneros Chardonnay. When you DJ you look to capture your audience with layers of music and sound. That’s exactly what this wine does for me. It flows over the palate with a hint of sweetness and the subtlety of fresh fruit, then lingers with a delicious aftertaste that begs for another sip. It’s the perfect wine for a warm afternoon or to enjoy with friends and family as you sit down for a meal of fish, chicken or pasta. The essence of a great DJ set is the mix and that’s exactly what this wine delivers, a mix that sweeps you up and has your tastebuds dancing. 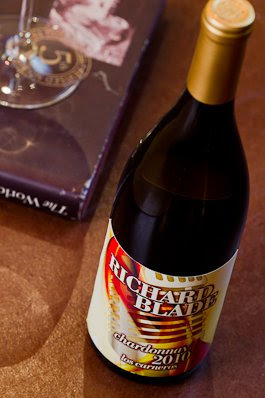 Says the great DJ, one of Waist High's all-time favorite people: "Really excited - last year I was contacted by a great winery in Napa - KSW Winery - who asked if they could put out a 'Richard Blade' wine as part of their artist series. After several tastings (yummy) and two harvests we've finally come up with an amazing Chardonnay that is being released (August 8). It's perfect for lunch or dinner or just enjoying while listening to DMode or The Cure LOL! I didn't want to talk about it before until it was 'real' but it's now available and you'll love it. For more details check out Kristian Story Wines."